The blade of the Ride Smart Knife is made of a 1095 high carbon steel, which makes a great all around knife. The Damascus look texture is a fire etching done in a coal forge. The blades are hardened to a 58 Rockwell. 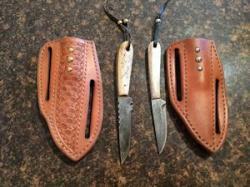 All knife sheaths are made from Herman Oak leather. 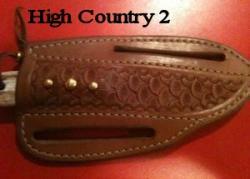 This knife and sheath is a smaller version of our original Ride Smart Knife and Sheath. The blade is 2 ¾” with an overall length of 6 1/8” making it the perfect size for women and children or anyone looking for a smaller everyday knife. This knife can be worn several different ways. The way it sits on an angle and hangs out of the way makes it great to use horse-back, hunting or as an everyday work knife. Right Hand knife implies you draw the knife with your right hand and the sheath sits on your left hip. 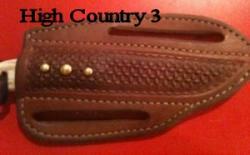 Left Hand knife implies you draw with your left hand and the sheath sits on your right hip.